A revolutionary new program which provides you an easy, efficient and legitimate method to search and download 100 million songs. Easy MP3 Downloader is not a Peer-to-Peer program. It's safe and 100% Legal. You can search and download over 100 million songs. It also recommends you hot songs to download. You can try music first and edit ID3v2 tag of the MP3 file. It's really easy to use and compatible with iPod and all the other portable devices. 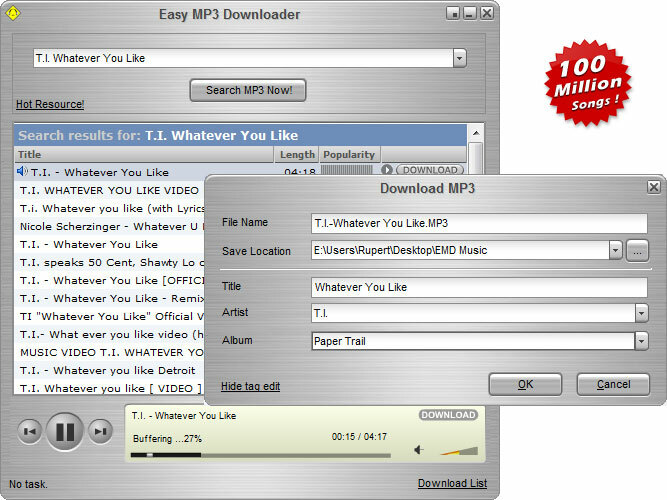 Easy MP3 Downloader also recommends you hot songs to ensure that you download the latest music you desire. You can try music first and edit ID3v2 tag of the MP3 file including the title, artist and album before you download it. Easy MP3 Downloader is really easy to use with the super friendly interface and compatible with iPod and all the other portable devices. * 100 MILLION Songs Available to Download - Largest music database online - Over 100 million songs of various styles. We are catering to everything that could entertain you. *100% Clean and Safe - Non-Peer-to-Peer program. Clean of any form of malware (viruses, spyware, adware, etc.). Free from bringing risk to your computer and give you relieved music enjoyment! * Easy to Use with Super Friendly Interface - All you need to do is just to type into the song name, then click search and download. That's it! Convert SWF files into MP3 and separate them to each sound element fast. Qweas is providing links to Easy MP3 Downloader 4.4.8.8 as a courtesy, and makes no representations regarding Easy MP3 Downloader or any other applications or any information related thereto. Any questions, complaints or claims regarding this application Easy MP3 Downloader 4.4.8.8 must be directed to the appropriate software vendor. You may click the publisher link of Easy MP3 Downloader on the top of this page to get more details about the vendor.